During spring migration a steady stream of waders pass through the various estuaries that sprinkle the UK coast. 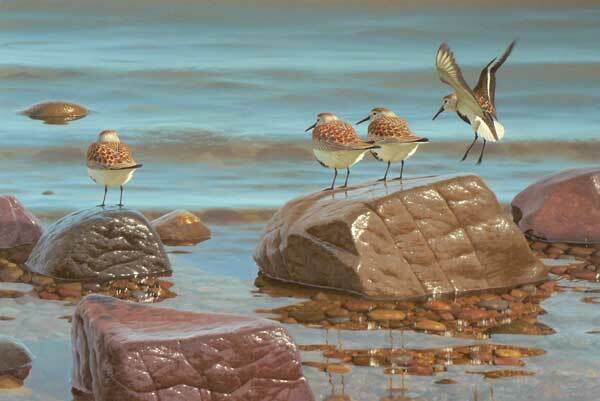 I was visiting my favourite ‘local patch’, Tyninghame estuary on the south east coast of Scotland, to gather information for another painting when I observed a small group of dunlin flitting along the shore. It was a spring tide and as high water reached its zenith this little band of travelers was being pushed off the few remaining exposed rocks at the top of the beach. Nervous and flighty, they skittered from rock to rock until suddenly, at some unseen signal, they lifted off, ‘peeping’ excitedly as they wheeled across the bay, heading northwards on the next stage of their long migration. This painting is also an exploration of the effects of light on water and wet rock. I liked the effect that the reflections of the rocks had on the water, blocking out the reflected sky so that the pebbles below the surface became clearly visible. A sense of scale is always important in a painting but is not always easy to convey. A living creature of a definite size is seen against a background of almost infinitely variable scale. A rock could be the size of a pea or a London bus, and a wave could be a ten metres high or no more than a ripple. Painting wildlife within a landscape is more about painting the landscape at the right scale to the wildlife rather than the other way round. 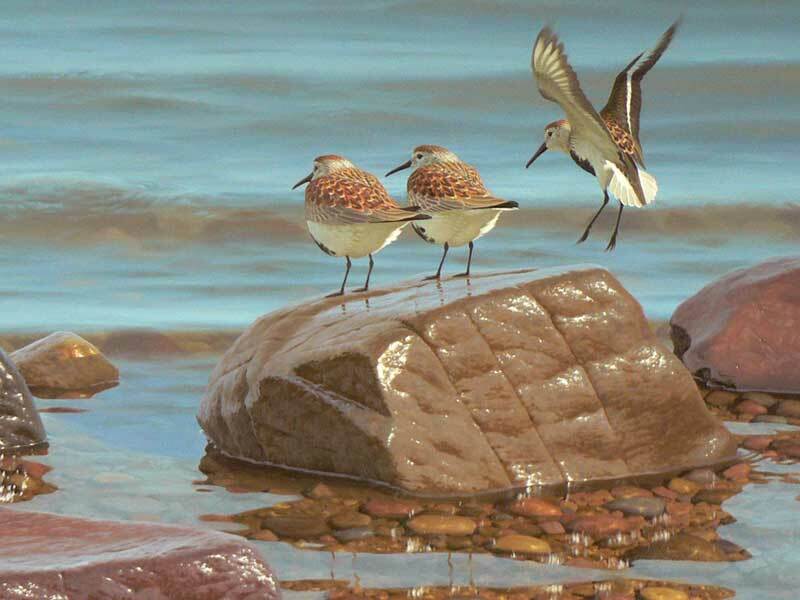 Dunlin are small waders – one will fit comfortably into a human hand – so I had to make sure that the water and the rocks did not appear too small by comparison.